You will find below our Global Twitter Top 10 video countdown with the most active financial institutions in February 2012. 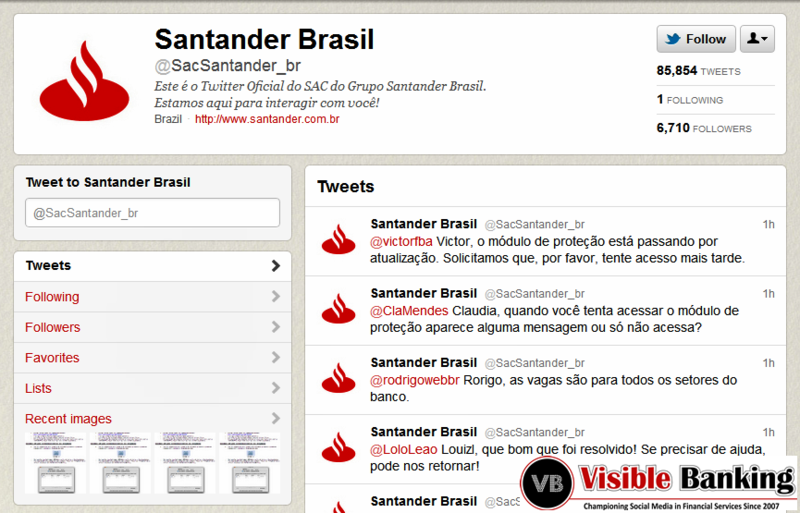 Santander, in Brazil, leads the way with 142 tweets a day on average. The levels of activity, engagement and ‘success’ vary tremendously from one region to the other. In the last twelve months, the Latin America and Asia Pacific regions became the fastest growing and the most active regions. So how active is the financial services industry? I invite you to check out our video Top 10 of the most active twitter accounts from the industry. Back in October 2011, I announced that according to our benchmark 90% of twitter accounts in financial services are Inactive. The situation has marginally changed, and most financial institution are clueless in regards to leveraging the popular microblogging service: they still don’t have a content strategy and they do a poor job engaging with their customers and their influencers. Just a few banks and insurance companies have started to develop and implement a more structured and engaged content strategy. I invite you to watch our Top 10 video countdown with the most active financial institutions in February 2012. Companies mentioned: Santander Brazil, FNB, Bank of America, Banesco, Bradesco, Kiatnakin Securities, H&R Block, Wells Fargo, BBVA. Please note that the top 10 includes a broad range of accounts focused on various topics such as brand, sport and customer care. I believe it won’t come as a surprise, but in general, the accounts dedicated to customer support are the most active in their country or region. Previous articleWith its ‘Social’ Credit Card is Citi More Innovative than Amex or Barclaycard?